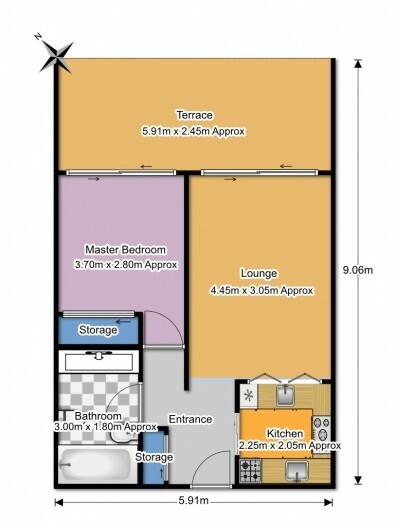 A spacious one bedroom, one bathroom modern apartment, furnished to a very high standard. There is a fully fitted kitchen, air conditioning in the lounge and a security alarm system fitted. Leading off the lounge and bedroom, there is a large sunny terrace, with great views to the swimming pool and the cliffs of Los Gigantes. The complex is extremely well maintained, boasting two swimming pools, jacuzzi and 24hr security. There is WIFI on the complex along with a range of British TV channels and lifts providing easy access to all floors. A central location, close by to shops, restaurants and local amenities. This is an ideal holiday apartment.